Miss Markas, 22, met with members of the Australian Catholic Youth Council this week and shared the story of her faith journey and the faith of the Chaldean Catholic community of which she is a member. She acknowledged that she will take with her the responsibility to speak on behalf of other young people, including the thousands who completed a survey explaining how they live out their faith. “Pope Francis has encouraged the Synod of Bishops to ‘go beyond what is familiar and known in order to encourage discussion’, and that discussion will be enriched by the views of the many young people in Australia who wanted to raise their voices,” Miss Markas said. ACBC Office for Youth director Malcolm Hart told Miss Markas that her qualities were what saw her chosen to attend the gathering of young people. “As the representative of young Australians, it is important for Angela to take with her the hopes and aspirations of her fellow Catholics, but that should not be done in a way that conceals her own experience,” Mr Hart said. 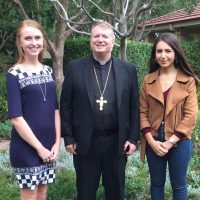 Sydney Archbishop Anthony Fisher OP, who along with Melbourne Auxiliary Bishop Mark Edwards OMI will attend the Synod of Bishops in October, was among those at the Youth Council to offer their support and prayers to Miss Markas. Ashleigh Green, who recently attended a gathering of young Catholics in Rome, was also at the Youth Council meeting. She said Miss Markas should be ready to speak honestly and openly about the place of faith and the Church in the lives of young Australians, which the National Youth Synod Survey explored.